Look effortlessly sophisticated in this 'Loryene' waterfall coat. 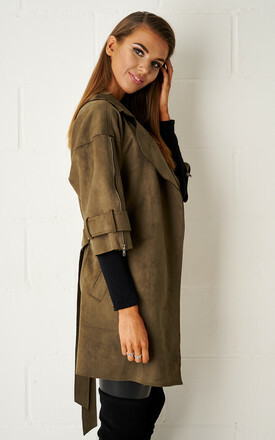 It's made from a soft and supple faux suede fabric in a stunning khaki green hue. Leave it open to really highlight the unique waterfall shape or create curves with the self tie belt. Wear with simple knitwear and leather look leggings.